A funny little novel about life in an Australian Primary School. 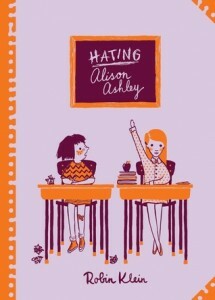 Best suited for ages 9-11, Hating Alison Ashley features a rather obnoxious grade 6 student. Readers of this age group will enjoy the humour, and the familiar situations, such as school camp. The protagonist Erika, nicknamed Yuk, is a great example of an unreliable narrator and there is a lot of enjoyment to be had in reading between the lines on many of the situations that arise throughout the story. When the outwardly perfect Alison Ashley arrives at Barringa East Primary Erika is initially determined to impress Alison, but quickly draws the assumption that Alison is too ‘high and mighty’ for the disadvantaged school with its rough and tumble collection of students and stressed out teachers. The story covers various different aspects typical to Primary School life, from visits to the sick bay to get out of class, hiding in the library to avoid social situations, messing around in art class, dealing with difficult classmates (surely every class has a ‘Barry Hollis’ who is always causing trouble!) and culminates in the highlight of any Primary School year, school camp. Erika goes on a wonderful journey, and ends the book appreciating her family rather than deriding them, finding her place as a director rather than as the lead actress, and of course making up with Alison Ashley and learning to understand that her outwardly perfect life might not be so perfect afterall. I think this is a really great book for Primary School aged students, but it’s not something that will appeal much to readers over the age of 12, as it is quite a simple, and young, little tale.